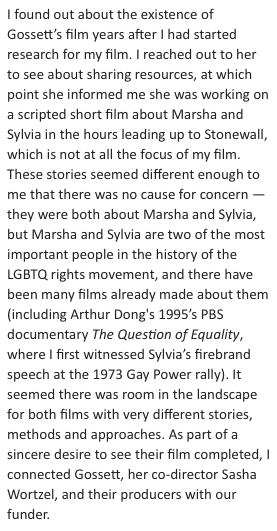 Netflix Doc ‘The Death and Life of Marsha P. Johnson’: Did Director David France Steal a Filmmaker’s Research? 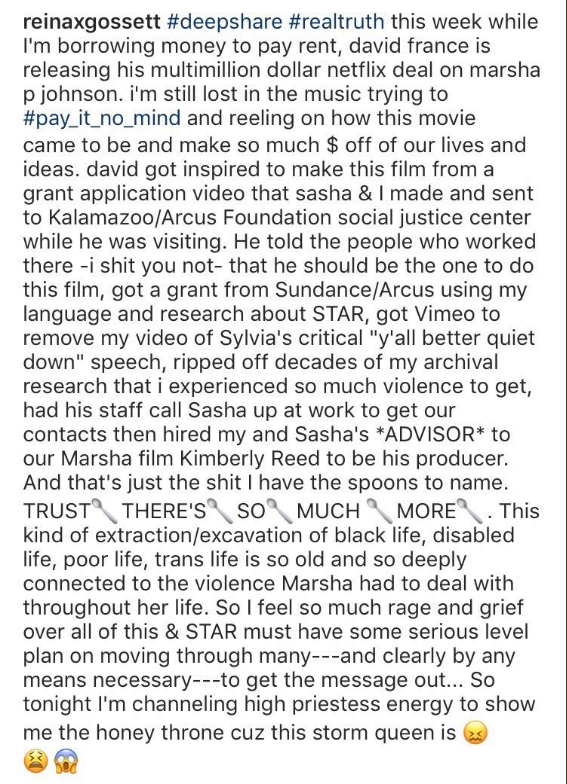 Reina Gossett called out David France on social media. 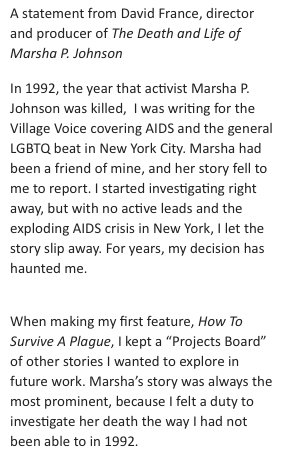 Gossett, a black, trans woman who currently serves as activist-in-residence at the Barnard College Center for Research on Women’s Social Justice Institute, wrote, directed, and produced with Wortzel “Happy Birthday, Marsha!” a fictional short film about gay liberation pioneer and drag queen Johnson, who some credit for the shattered shot glass that launched New York City’s Stonewall riots. Set in the hours prior to that historic night in 1969, “Happy Birthday, Marsha!” starred “Tangerine” actress Mya Taylor and benefited from more than $35,000 in Indiegogo donations. Shortly after Gossett published her statement, France refuted its claims, also on Twitter. On Oct. 8, he released an official statement. France wrote that he began investigating Johnson when she was found dead in 1992 at age 46, after she’d been missing for six days. At the time, France was covering LGBTQ issues for The Village Voice. But the case had no active leads, and the AIDS crisis was unfolding. Two decades later, France began looking into Johnson’s death once again, carrying out his “own scholarship,” which included sourcing, digitizing and licensing archival footage with help from the Anti Violence Project, and interviewing those who knew Johnson and Riviera. A 2013 Best Documentary Oscar nominee for “How to Survive a Plague,” France adapted that film into his fourth book, subtitled, “The Inside Story of How Citizens and Science Tamed AIDS.” He lost his boyfriend to the disease in 1991. Netflix, via a spokesperson, said they have no comment. Gossett has not yet respond to IndieWire’s emails. France also wrote “Our Fathers: The Secret Life of the Catholic Church in an Age of Scandal,” which became a Showtime film starring Ted Danson, Christopher Plummer, Brian Dennehy and Ellen Burstyn. 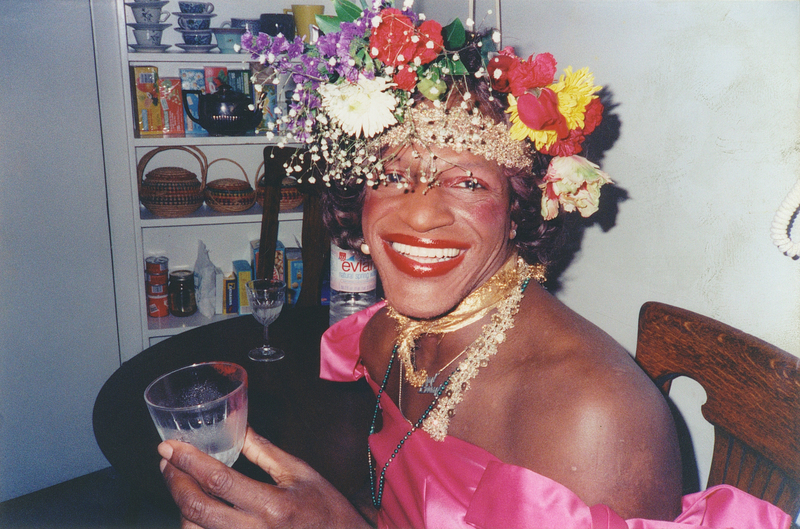 “The Death and Life of Marsha P. Johnson” premiered at this year’s Tribeca Film Festival. Watch the trailer below.